Ready to tackle a DIY project that will increase the value of your home? Consider giving your plain looking deck a dramatic new facelift. By adding a few extra touches, you can give your family’s outdoor living space the wow factor they (not to mention prospective buyers) will love. Does Your Deck Add to Your Home’s Appeal? Adding a deck or renovating an existing one is one of the top five ways you can improve the value of your home. It even ranks higher than adding an additional bathroom! Ask yourself – does my deck add to the appeal of my home? A lackluster outdoor space does nothing to increase your family’s enjoyment or to catch a buyer’s eye. Take the next step and improve the look of your exterior by renovating your deck. Pressure wash – A clean deck makes it easier to determine its condition. Inspect the structure – Are there cracked or rotten deck boards? Are the supports in good condition? If your deck is old and in bad shape, you may want to rebuild rather than trying to fix it. Re-finish – If your deck boards are in good shape, weather-proof it with a sealant. You should do this every couple of years. Determine your design/budget – Know how much you want to spend, then come up with a game plan and design ideas. Production – Decide if you want to do all of the work yourself or hire professionals like electricians or landscapers to do certain parts. Think of ways to improve how your deck functions. Are there things you can add that will make dining outside easier? Do you want to create a mood (Zen and relaxing) or a feeling (romantic or rustic) in your outdoor area? Your deck project can run the gamut from adding design elements like cushions and pillows to constructing adjacent levels for seating. Lighting – If you like to cook outside, increase the lighting near your grill area. Add pod lights to the steps for added safety. Railings –Use different materials like steel cables, glass panels, composite or vinyl to contrast the deck boards and add interest. Additional entryways – To improve the flow and functionality, add another door onto the deck or a second set of steps to the yard. Built–in seating – Add them around the perimeter to provide extra entertaining space. 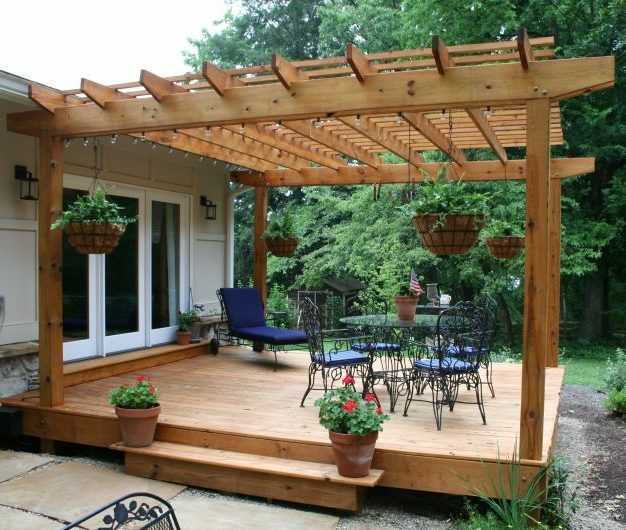 Pergola or canopy – A shady place to sit and relax is always a winner. Decorative planters – Build them onto the railing or as freestanding units that fill awkward or vacant corners. If you do have to re-build all or sections of your deck, check out some of the new building materials available. While pressure-treated lumber is still the most commonly used material, composite and vinyl are gaining in popularity. They are durable, maintenance-free and often come with warranties but cost more than wood. Cedar, redwood and hardwoods like Ipe and Jarrah are fast becoming favorites due to the natural weathered patina they develop over time. Give your deck a facelift and boost your home’s value. Add a few of our DIY projects to your Spring to-do list and transform a bland looking space into a spectacular entertainment area. Reap the rewards of your hard work well into the Fall and beyond. Party at your house! From pressure washers and post hole diggers to drills and band saws, our staff can help you choose the right tools to renovate or build your deck. Need advice on how to re-finish your space? Our blog, Seal and Stain Your Deck in 3 Easy Steps, has great tips on what you need for the final step of this DIY project. Don’t hesitate to contact us or stop by our store if you have questions about pricing or how to’s — we’re open seven days a week. Thanks for Sharing this essential Tips.